The door to the Buffalo Sabres' bench was slammed after many of their shifts. Boos echoed throughout KeyBank Center after the first, second and third periods. Few glass-wobbling hits were delivered. And many of the Sabres' 38 shots on goal Sunday night resulted in heads shaking in frustration or disbelief. Though most of the sights and sounds of their season's 79th chapter were eerily familiar to the Sabres, the thousands of empty seats in the third period of a 4-0 loss to the Columbus Blue Jackets further illustrated how far professional hockey in Buffalo has fallen in a matter of four months. After many of the announced crowd of 17,990 departed early, one of the loudest ovations of the night occurred with the announcement that only one minute was remaining in regulation, and a "CBJ" chant echoed in the game's final moments. That reaction did not seem to surprise Sabres players after they were shut out for the fifth time in 12 games. 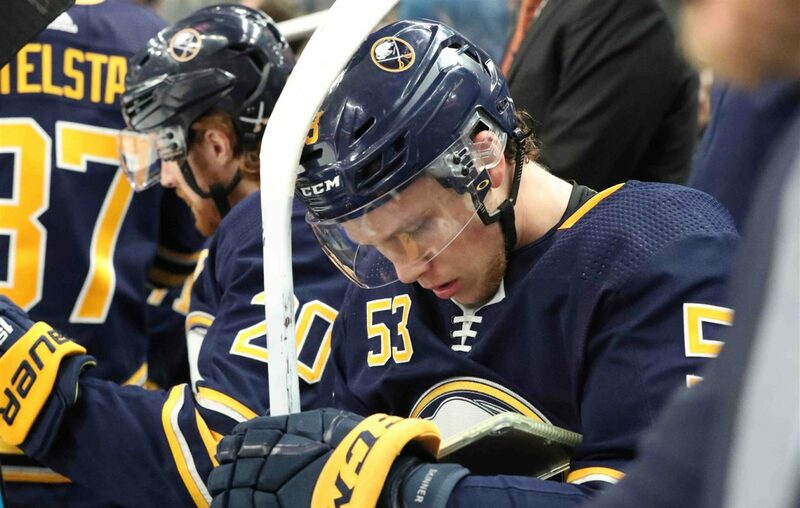 The Sabres (31-38-10) are 3-17-3 over their last 23 games, won only twice in 15 games during the month of March, and have matched a season-high seven-game winless streak. Their league-worst 36 points over the past 54 games caused them to tumble from first to 27th in the NHL. Instead of preparing for his first playoff series as Sabres general manager, Jason Botterill will be attending the NHL's Draft Lottery in Toronto on April 9. The team's fans were somewhat forgiving during an eight-point January and when four regulation wins in February still had them competing for a playoff spot. Their frustrations came to a head on the second night of a back-to-back. 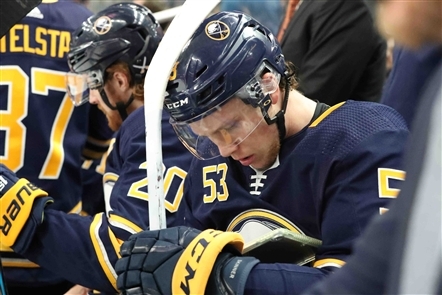 It did not matter that the Sabres fared better than their 5-1 loss Saturday to the New York Islanders, or that the Blue Jackets (45-30-4) have outscored their opponents 24-4 during a five-game winning streak in a push for the playoffs. Columbus' goalie, Sergei Bobrovsky, has won five straight starts with a league-leading nine shutouts. The familiar nature of the loss did not sit well with players or fans who watched the season slip away. Again, the Sabres had an excellent start — they out-shot Columbus, 7-1, over the game's first six minutes — only to watch one mistake snowball into a multi-goal deficit. The issues began when Zemgus Girgensons lost a defensive-zone faceoff, and the Blue Jackets capitalized when Pierre-Luc Dubois tipped Seth Jones' shot past Ullmark for a 1-0 lead at 7:14 into the first period. The lead got pushed to two goals with 6:14 remaining before the first intermission when Oliver Bjorkstrand's was allowed to unleash an uncontested slap shot from the slot one second after a Blue Jackets power play. "It’s always difficult when you don’t get the results," Sabres coach Phil Housley lamented. "I know this is part of the process for us. I’m frustrated, because for the most part, I think our guys have been working very hard and they’re not getting rewarded and they got to find a way. But it takes everybody on our lineup. Whoever’s in the lineup, we can’t have two or three guys off, because we just don’t have that kind of a lineup. "It’s frustrating. I understand the fans’ frustration. Guys are frustrated. They want to do better at home here. Our home record has been good, so I understand." The Sabres were without four of their top-seven defensemen because of injury: Marco Scandella, Zach Bogosian, Rasmus Ristolainen and Matt Hunwick. But their defensive-zone coverage was not nearly as poor as it had been over the past month. Instead, goaltending was an issue. Ullmark, who is 1-9-1 in his last 11 appearances, was caught out of position at his left post when Nick Foligno gave Columbus a 3-0 lead with a wraparound goal to the right post at 17:47 into the first period. Ullmark also gave up a five-hole goal at 15:31 into the second period when Josh Anderson's shot from the left-wing circle went between the goalie's leg pads. Again, the Sabres had trouble explaining how one goal against turned into an insurmountable deficit. Foligno thought a three-goal lead was demoralizing to the Sabres. "Yeah, not to be rude — it's not my worry," Foligno said with a laugh. "Yeah, no, I'm not concerned about them. I just liked the way we were playing. Our goal is to get into the playoffs." The Sabres again struggled to generate scoring chances. Okposo, Jack Eichel and Brandon Montour accounted for 20 of the team's 38 shots on goal. Only two others had more than two shots. Their best scoring opportunity came in the third period, when Montour's slap shot created a rebound but Skinner could not beat Bobrovsky from the slot. Though the Sabres' fate was sealed more than one week ago, they again insisted no one has quit with three games remaining. "Everyone is competing for something," Sabres defenseman Jake McCabe said. "We’re not quitting. We’re showing resiliency. Guys are battling through the end, and obviously we continue to end up on the wrong side of things right now, but we’re going to continue harping [the importance of] competing and work ethic."